After qualification from the Welsh National School of Medicine in 1968 Dr Morgan was a partner in a large general practice in West Cardiff for 34 years, 26 of them as senior partner. The practice was the first in the county to be granted fundholder status and was able to develop some innovative ideas to improve care in the community. During his time as a GP he was very involved in health service management, becoming chair of the local medical committee, and a long standing member of the South Glamorgan FHSA, chairing a number of its committees. He was also very active in the training and assessment of GPs and was the GP Vocational Training organiser in South Glamorgan for several years, and an examiner for the Royal College of GP’s and the GMC. He held numerous offices in the RCGP, including Welsh Council chairman and was a College council member and trustee for 10 years. He was one of only two GP members on the Department of Health’s Clinical Standards Advisory Group (the precursor of NICE). In 2003 he was awarded an Honorary Fellowship of the University Of Wales College of Medicine (now part of Cardiff University) for services to Postgraduate Medicine in Wales. After leaving his practice he became Primary Care Advisor for Wales for the National Clinical Assessment Service and was a member of the Postgraduate Medical Education and Training Board, whilst maintaining his examination input. He was a part-time medical member of the Ministry of Justice Tribunal Service. 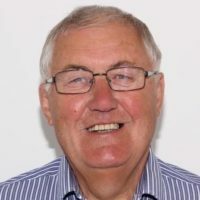 He has been a director of Drugaid, a locally based drug advisory service, and is Past President and trustee of the Rotary Club of Llandaff, and a member of Llandaff Cathedral Parochial Church Council, and its Guild of Stewards. For some years he was a ‘Radio Doc” on BBC Wales, and for many years Medical Officer to Glamorgan Wanderers RFC. He has been a long standing committee member of the Friends of Insole Court.